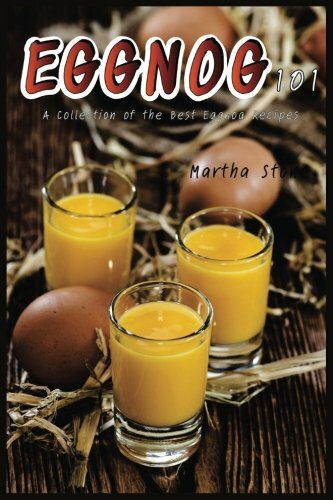 I have been searching for recipes using eggnog since I just found out that December 24th is National Eggnog Day! Eggnog has been a traditional part of holiday festivities in America since the 18th century. Eggnog is a sweetened beverage that is traditionally made with milk or cream, sugar, and whipped eggs (which gives it a frothy texture). It is often topped with a bit of ground cinnamon, nutmeg, or pumpkin spice. This post contains affiliate links and I will be compensated if you make a purchase after clicking on my links. This Cranberry Almond Eggnog Bread is the perfect bread to set out during the holidays. Rich and delicious, it’s easy to make and something your guests will enjoy with coffee. Loaf pan – You can use a traditional metal loaf pan sprayed with olive oil. 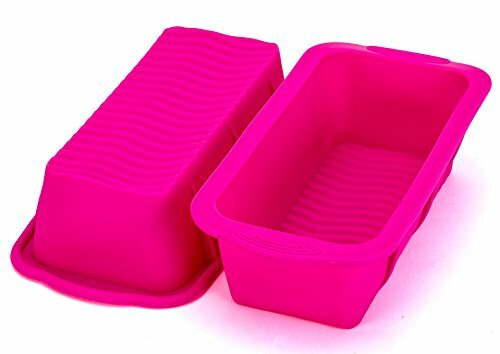 But, it is really so much easier to use a silicone loaf pan. the Cranberry Almond Eggnog Bread will not stick at all if you bake in silicone. Eggnog – Of course, you will need eggnog. You can buy it ready-made at the grocery store. 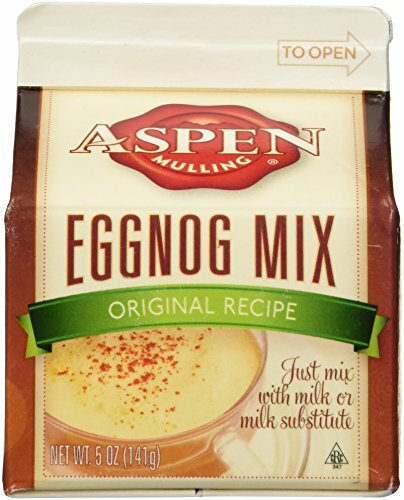 Or, you can start with an eggnog mix and make it at home. Ginger grater – If you are going to grate fresh ginger over your eggnog, you’ll want a ginger grater. Can I just say “yum”? Since we are all HUGE fans of eggnog, it’s very important that I make this recipe as soon as I bring the eggnog into the house. If I just put the quart of eggnog into the refrigerator and intend to make the recipe later, I’ll return in an hour and the eggnog will all be gone. Beat the eggs, sugar and butter. Slowly mix in the flour, baking powder and salt, adding the eggnog part way through. Stir until blended. Stir in the cranberries and almonds. Pour into an 8x4 loaf pan that has been well sprayed with non stick spray. I use an organic olive oil spray. Or use a silicone loaf pan. Bake 350F for 70 minutes or until knife inserted in the middle comes out clean. Cool in pan for 15 minutes & then continue cooling on wire rack. This recipe is very easy to make. You can change the additions based on what you have in the house. My favorites are dried cranberries and slivered almonds. You can substitute raisins, chopped cherries or dried cherries for the cranberries if you prefer. Walnuts or pecans work as well as almonds if that’s what you have on hand. Want more quick bread recipes? Oh I bet this would be enjoyed by everyone on Christmas morning - children and adults both! This looks wonderful. I made an eggnog braid and eggnog sugar cookies last Christmas, but sadly haven't had a chance to do much baking with eggnog this year. Ooh, that would be great with the pop of flavor from the cranberries! That looks delicious. We buy tons of eggnog this time of year! The same thing happens at my house with the eggnog! It disappears fast. I didn't know Dec. 24 was National EggNog day but it makes total sense! This looks yummy. Yum! I need to pick eggnog up for the holidays tonight at the store. It is a family favorite this time of year. I think almost everyone in my house would love this bread. I adore eggnog, but try to only buy it once or twice during the season to keep my waistline in check. I am drooling. This look so good!!! I have never heard of this before but it sounds amazing!! I love baking with egg nog. I love the flavor it gives everything. This bread sounds so good. My husband loves eggnog, and he loves bread. We are going to have to make this one.. This sounds crazy but I have never had eggnog. LOL But your bread looks yummy! looks amazing, ellen. my dad always LOVED eggnog sooo much! I have never thought of making bread with eggnog, but not that I see it, it makes perfect sense and sounds yummy! Can you believe I have never had eggnog? This bread looks so good, though!!! Oh wow, that looks (and sounds) wonderful! I had not even thought to use eggnog in a bread recipe. That is a great idea!